Every year it's the same thing. You fill out your NCAA Tournament bracket feeling comfortable about your chances, only to tear it up before the second weekend of games. We're not perfect, either, but we'll give you some tips to help calm the March Madness. Every year it's the same thing. You fill out your [NCAA Tournament bracket](https://www.betchicago.com/ncaa-tournament-2019-point-spreads-oregon-wisconsin-odds) feeling comfortable about your chances, only to tear it up before the second weekend of games. We're not perfect, either, but we'll give you some tips to help calm the March Madness. 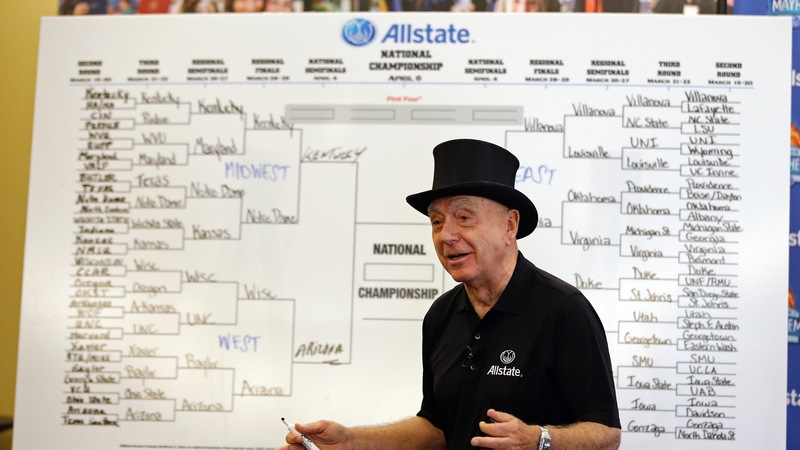 __READ:__ [All of our 2019 NCAA Tournament coverage](https://www.betchicago.com/ncaa-basketball-betting) ## NCAA Tournament bracket tips 1. Contrary to popular belief, a No. 12 seed doesn't *always* win a game in the first round, but it usually happens. It didn't happen last year, for example, but it did seven of the eight years prior. Twice two No. 12s advanced, and twice three did. There have been years the 12s to spring an upset have been mid-majors (Stephen F. Austin, Harvard and North Dakota State in 2014), and years they've come from power conferences (Oregon, Ole Miss and Cal in 2013). Murray State will be the trendy 5/12 upset pick because of [Ja Morant](https://www.sports-reference.com/cbb/players/temetrius-morant-1.html), and the Racers are only 4.5-point underdogs. But Pac 12 champ Oregon is the real No. 12 to watch as only a 1-point dog to Wisconsin, which has lost seven of its last 10 against the spread. 2. Since the tournament expanded to 68 teams in 2011 (with [four play-in games](https://www.betchicago.com/ncaa-tournament-betting-lines-odds-predictions-belmont-temple-first-four)), at least one team playing in First Four has advanced at least another game. But VCU's run to the Final Four in 2011 was the only time one of those teams advanced beyond the Sweet 16 -- which is when Syracuse bowed out last year to Duke. Who's got the best shot this year? Well, Arizona State (which play St. John's on Wednesday) enters the tournament on a 6-2 stretch, with both losses coming against Oregon, who we just said to watch as a potential threat. The Sun Devils have a coach (Bobby Hurley) who won the tournament twice as a player with Duke and four players [averaging in double figures](https://www.sports-reference.com/cbb/schools/arizona-state/2019.html). 3. There's a lot of groupthink among people filling out brackets, which is why nearly 45 percent of ESPN brackets had Duke winning the title as of Monday afternoon (and more than half with either Duke or North Carolina winning it). The Blue Devils are the clear favorites -- [and for good reason](https://www.betchicago.com/ncaa-tournament-2019-defining-strengths-top-eight-seeds) -- but they [sometimes struggle shooting the ball](https://twitter.com/ESPNStatsInfo/status/1107456811144114176), which could lead to a team like Gonzaga (also a 1 seed and having already beaten Duke this season) swooping in and winning its first national championship. Don't go too deep when picking a champion, though, as there are likely only [a handful of teams in the field](https://www.betchicago.com/ncaa-tournament-2019-betting-kenpom-national-champion) good enough to win it all. Also, there has been at least one No. 1 seed in the last seven Final Fours, and a 1 seed has won three of the last four and five of the last seven national championships. 4. Don't go crazy with the upsets. There are 32 first-round games, and since the field expaanded to 64 teams in 1985, there have been [an average of six upsets in that round](https://www.ncaa.com/news/basketball-men/bracketiq/2018-03-13/heres-how-pick-march-madness-upsets-according-data), with a high of 10 in 2016 and a low of just two in 2007. That's it. So, to put it another way, the higher-seeded team usually goes 26-6 in the first round. Mmmm chalky. So don't just pick Colgate because it's the name of your favorite brand of toothpaste. 5. Don't pick a No. 16 seed. Tempting as it may to be the only person in your pool to have Gardner–Webb or Iona, 16 seeds are 1-135 in first-round games -- the one win, of course, being UMBC's win over Virginia last year. No. 15 seeds are 8-128, so I'd probably avoid those, too. There's a good breakdown for every seed in the tournament for every round [here](https://www.betfirm.com/seeds-national-championship-odds/). __PLAY:__ Our [free daily contests](https://betchicago.chalkline.com) for the chance to win a BetChicago prize pack.